Ubuntu 10.04(Lucid Lynx) has already a default e-book or pdf Reader – Document Viewer(Which is probably sufficient for most of the users) but even though you want Adobe Reader – Acroread for Ubuntu 10.04 Then this post will help you in installing Adobe PDF reader on your PC. Actually Adobe reader has added recently in to the Repository Package or you may say Synaptic Package Manager,which makes your task much easier.Although it’s no different matter that you can also install adobe reader more quickly with one simple commands.Other possible ways to install adobe reader might include Ubuntu Software Center,which contains all the common useful applications grouped and categorized so that an average user can easily manage applications on Ubuntu 10.04. #1. Open Synaptic Package Manager(Go to System->Administration->S-P-M). #2. Then search for “adobe reader” or “acroread” and check the left box for installation. #3. 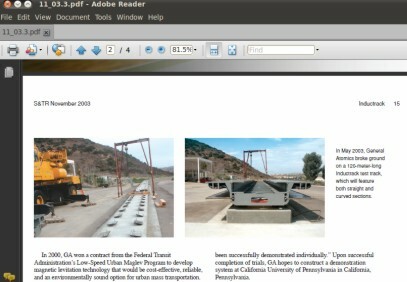 Next,Click on Apply to install adobe reader on your ubuntu 10.04 lucid lynx. #4. Wait…(~10 minutes)until the installation will complete.In the end will it will ask you whether you want to set the Adobe as Default PDF reader or not,choose YES if you want else NO if you don’t. #5. Now you are ready to view or print pdf files using Adobe Reader…Right click on any pdf files and then open with Adobe Reader 9. Open terminal from Applications->Accessories->Terminal and type the command -(And enter your login password if prompted)..